We’d love your help. Let us know what’s wrong with this preview of The East End by Jason Allen. THE EAST END is an atmospheric debut novel of family secrets and scandal, of love and heartbreak, of working class struggle versus the privileges of the super wealthy, all set in a place whose incredible beauty means both pleasure and pain – a place where people will die for love, kill for truth, and dream of escaping forever. THE EAST END opens with Corey Halpern, a Hampto THE EAST END is an atmospheric debut novel of family secrets and scandal, of love and heartbreak, of working class struggle versus the privileges of the super wealthy, all set in a place whose incredible beauty means both pleasure and pain – a place where people will die for love, kill for truth, and dream of escaping forever. THE EAST END opens with Corey Halpern, a Hamptons local from a broken home who breaks into mansions at night for kicks. He likes the rush and admittedly, the escapism. One night just before Memorial Day weekend, he breaks into the wrong home at the wrong time: the Sheffield estate where he and his mother work. Under the cover of darkness, their boss Leo Sheffield -- billionaire CEO, patriarch, and owner of the vast lakeside manor -- arrives unexpectedly with his lover, Henry. After a shocking poolside accident leaves Henry dead, everything depends on Leo burying the truth. But unfortunately for him, Corey saw what happened and there are other eyes in the shadows. Hordes of family and guests are coming to the estate the next morning, including Leo's surly wife, all expecting a lavish vacation weekend of poolside drinks, evening parties, and fireworks filling the sky. No one can know there’s a dead man in the woods, and there is no one Leo can turn to. With his very life on the line, everything will come down to a split-second decision. For all of the main players—Leo, Gina, and Corey alike—time is ticking down, and the world they’ve known is set to explode. To ask other readers questions about The East End, please sign up. Debut author - Jason Allen - is a mean human being. Hasn’t he read the reports of the essentials of sleep? My trail hike this morning- is definitely going to be an upward climb. but it’s got ‘something’ going for it!! Seriously something unique is going on here. “The East End”, is the best anti-murder- intrigue- meshuggah - novel on crack. We’re taken on a wild trip! It has a few flaws..but so do some of my favorite songs ..
“Who Put The Bomp ”, by Barry Mann. that slowing went into my body like an IV drip. This Jason Allen guy has an artistic flair for painting atmospheric- psychedelic-type-psychological scenes...with characters we will remember. I liked it!! I’d read a sequel!!! Or Jason’s next book!! You crack me up in a GREAT WAY! Do I get to take you to lunch for our B’days next month? I won this in the giveaway! This was an awesome read that was well-written and entertaining enough to distract me from my troubles. I had the great fortune of snagging an ARC of Allen's THE EAST END recently, and it's been an incredibly intense and outstanding read. From the opening line that counts down to Corey's break-in at a Hamptons estate through to the explosive climax, I loved reading about these characters' engines. As in what drives Corey to commit these small crimes, or what motivates his mother, Gina, to weather the abuses made by her volatile ex. Or what forces her employer, Leo, into hiding his own secrets away I had the great fortune of snagging an ARC of Allen's THE EAST END recently, and it's been an incredibly intense and outstanding read. From the opening line that counts down to Corey's break-in at a Hamptons estate through to the explosive climax, I loved reading about these characters' engines. As in what drives Corey to commit these small crimes, or what motivates his mother, Gina, to weather the abuses made by her volatile ex. Or what forces her employer, Leo, into hiding his own secrets away from the prying eyes of his affluent neighbors. Allen provides these amazing, piercing looks into the mechanisms of people who work so hard and endure such incredible risks for their own tiny outlets of sanity, and I loved reading about what each of these people has suffered and forfeited in their lives. It's a brilliant book, not just because Allen is one of those poets who can expertly craft the language of their novels -- think Alice Sebold, Ben Lerner, Anne Carson, for example -- but also because it's fascinating to watch what happens when social classes collide violently, and when the upper class expects to survive these collisions unscathed. Many thanks to NetGalley and Harlequin Publishers for this powerful, gripping and suspenseful novel, which focuses on socioeconomic disparity. It shows both the super-wealthy as well as the townspeople who labour in their elaborate mansions can be trapped by circumstances and haunted by their past. I found the characters to be memorable but unlikeable, mostly existing in a haze of alcohol and drugs. Nevertheless, I found myself caring about their outcome. I was riveted to the pages throughout, Many thanks to NetGalley and Harlequin Publishers for this powerful, gripping and suspenseful novel, which focuses on socioeconomic disparity. It shows both the super-wealthy as well as the townspeople who labour in their elaborate mansions can be trapped by circumstances and haunted by their past. I found the characters to be memorable but unlikeable, mostly existing in a haze of alcohol and drugs. Nevertheless, I found myself caring about their outcome. I was riveted to the pages throughout, engrossed in the drama and the suspense of how the story would be played out. Written in atmospheric prose, and with remarkable character insight and development, I hope to read more of the author's books. This intense story covers a couple of days at a billionaire's Hampton mansion. A tragedy occurs which has escalating fallout involving the distraught homeowner and an unhappy housekeeper and her son who work for him. All are regretting the unhappy prospects facing them and hoping for a better life. When a horrible accident at a wealthy family's estate threatens to bring uncomfortable secrets to light, a young man who was in the wrong place at the right time must make some life-changing choices- and quickly. This drama will keep readers glued to the page with its urgency, sympathy, and subtle social commentary. Twist and turns like no other. Characters memorable. Well worth the time to read. Great job. Thanks to author,publisher and Netgalley for the chance to read this book. While I got the book for free ,it had no bearing on the rating I gave it. Ive experienced the side of the area Allen writes of first hand. He paints a tapestry of rich,and poor of the wallet,and soul that is amazing. Sometimes the most interesting people are overlooked. While we strive to be people who have less day to day struggles Allen makes me grateful for the perspective they bring. Cheers to him ,and his sacrifices! I thought this was such an amazing, quick read. While not my normal thriller, I still found myself completely immersed in what I was reading and had a hard time shutting it and reading others, or even going to bed. It’s more of a drama, and a book that really delves into the socioeconomic differences, in areas where the poor tend to stay at a place year round, and the very wealthy tend to visit for summers or even weekends; which I thought was very well done and interesting. I thought the author I thought this was such an amazing, quick read. While not my normal thriller, I still found myself completely immersed in what I was reading and had a hard time shutting it and reading others, or even going to bed. It’s more of a drama, and a book that really delves into the socioeconomic differences, in areas where the poor tend to stay at a place year round, and the very wealthy tend to visit for summers or even weekends; which I thought was very well done and interesting. I thought the author did a good job, of setting up a great suspense book, which really hit on some realities many face in a way that I think many could learn from. I’ve read quite a few of the upcoming 2019 PARKROW PUBLISHING HOUSE/HARPERCOLLINS books and I will tell you that they have an absolutely MASSIVE amount of STELLAR books headed readers, the thrillers including this, will blow any thriller lover out of the water! A huge hit for me and one I will definitely be recommending. I was oh so lucky to win this book in a Goodreads Giveaway, it is a different read for me and I really got into it, hating when I had to put it down. I enjoyed the characters, although I didn’t have to good an idea what some of them looked like. I really felt for Corey and some of the horrible situations he faced, and yet got a kick out of some of his pranks, and deep down I was rooting for him. Yes it hit me with something I did not expect and I was captivated so I will be recommending to frien I was oh so lucky to win this book in a Goodreads Giveaway, it is a different read for me and I really got into it, hating when I had to put it down. I enjoyed the characters, although I didn’t have to good an idea what some of them looked like. I really felt for Corey and some of the horrible situations he faced, and yet got a kick out of some of his pranks, and deep down I was rooting for him. There is absolutely nothing I liked about this book. It had a preposterous plot, unlikable characters and so many cringe inducing moments. Please don't waste your time like I did reading this. A big problem with this book is that there's no real tragedy, conspiracy, or deep dark secret. Men like Leo have lawyers or fixers that could have solved his problem discretely. Henry's death was an OD so Leo committed no crime. Hiding the body because he wanted to keep his sexuality a secret was not the smartest move but it's not a felony. Any Manhattan lawyer gets him off with a fine and a slap on the wrist..
Another problem with this book is hiding your sexuality from the outside world is old A big problem with this book is that there's no real tragedy, conspiracy, or deep dark secret. Men like Leo have lawyers or fixers that could have solved his problem discretely. Henry's death was an OD so Leo committed no crime. Hiding the body because he wanted to keep his sexuality a secret was not the smartest move but it's not a felony. Any Manhattan lawyer gets him off with a fine and a slap on the wrist..
Another problem with this book is hiding your sexuality from the outside world is old. That story line isn't interesting anymore. Tim Cook the CEO of Apple is gay. Hasn't stopped him from being one of the wealthiest men on earth. Plus Leo's wife Sheila was nasty. He should have divorced her years ago. His children would have been understanding and proud of their father coming out. Wow! I was pretty much sucked into this mystery from the first page. Its an incredibly intense and outstanding novel about what happens when the haves and he have-nots collide. This was a compelling, and wholly original novel that I absolutely loved and highly recommend. An advance reader copy was provided by the publisher via Netgalley in exchange for my honest review. I won this book from GoodReads! This suspenseful story had me turning pages in the wee hours in order to finish the book. My thanks to the author, the publisher and NetGalley for an ARC of this novel in exchange for an honest opinion. Unfortunately, I could not get around the bleak atmosphere of the first chapter of this novel. The characters did not appeal to me, there was paragraph after paragraph of narrative and description with very little dialogue, and the characters in this novel did not ring true to me. I see that other reviewers really enjoyed this novel. The synopsis on NetGalley had sounded so appealing t My thanks to the author, the publisher and NetGalley for an ARC of this novel in exchange for an honest opinion. Unfortunately, I could not get around the bleak atmosphere of the first chapter of this novel. The characters did not appeal to me, there was paragraph after paragraph of narrative and description with very little dialogue, and the characters in this novel did not ring true to me. I see that other reviewers really enjoyed this novel. The synopsis on NetGalley had sounded so appealing to me. I never managed to get into the book or feel connected to the characters, unfortunately. It was one big rush, like being at a crossroad without signs or lights, and everyone races over it without caring for any other. And, I'm so sorry, none of the characters was likeable or that interesting that I got something else. Sad because the plot sounded so good to me and I was really looking forward to the read and happy when the publisher and Netgalley offered it. This book is about people making bad choices and other people watching them. I've read many books that take place in the glitzy Hamptons, but this one that stands out. It has tragedy and mystery, but there is a comedic aspect that made me laugh many times. The story also highlights a situation that is very dominant in the Hamptons: struggles of the working class and the polar opposite world of the super wealthy. It delves into socio-economic disparity - townie vs. vacationer, white collar vs. blu This book is about people making bad choices and other people watching them. I've read many books that take place in the glitzy Hamptons, but this one that stands out. It has tragedy and mystery, but there is a comedic aspect that made me laugh many times. The story also highlights a situation that is very dominant in the Hamptons: struggles of the working class and the polar opposite world of the super wealthy. It delves into socio-economic disparity - townie vs. vacationer, white collar vs. blue collar, "upstairs" vs. "downstairs" - and what divides the two groups. This book is about scandal, secrets, love, family, addiction, tragedy, class, greed, and voyeurism. The story is a slow burning mystery, but has underlying themes of class, social structure, and discrimination wrapped up in family drama. It will make you appreciate your own family. A wrong side of the tracks employee illegally enters the mansion of his boss and witnesses a horrifying tragedy. This character has to decide what to do when it becomes obvious that his boss is going to cover it up. Wealth, privilege, affairs, jealousy, secrets all rear up in the wake. Very interesting read. A little heavy on description and light on dialogue. Leaves alot of questions unanswered. One moment escalated into more, creating a crazy chain of events causing one man to become stuck in an impossible position. This story reminded me of Horrible Bosses with all the crazy chaos taking place while in the bosses home. There are three story’s being told: family secrets and scandal, love and heartbreak, and working class struggles amongst the wealthy. All these stories intersect with each other eventually. Would have been nice to get some type of notification that the chapters switched f One moment escalated into more, creating a crazy chain of events causing one man to become stuck in an impossible position. There are three story’s being told: family secrets and scandal, love and heartbreak, and working class struggles amongst the wealthy. All these stories intersect with each other eventually. Would have been nice to get some type of notification that the chapters switched from one character to another. There is some some exciting activity in the story, but there is also a lot of minute details as well. In order to reach the pertinent information faster I chose to skim thru portions of the chapters. I wasn’t expecting the story to get off topic from the situation Corey encountered at The Sheffield property. But then again I realize the book description clearly states that this story focuses on three primary topics. I guess what I don’t like is the way the story is laid out. It’s execution of these three stories was dull individually. This one night turned into a fiasco quickly escalating the chaos. I was disappointed an entire story was spent rehashing the same scenes. Within all the chaos very little was accomplished. The East End by Jason Allen was too busy for me. Too much was fit into the story. Once I started reading it instead of having a difficult time putting it down, I had a difficult time forcing myself to read more. I was given an early copy to review. What do you picture when you think of a book about The Hamptons? I imagine glamorous parties and sandy beaches and chic fashion. What's so unique about The East End is that it highlights a completely different view of The Hamptons. It is grungy and gritty and shows the less alluring side of life on the island. But it is real and honest, highlighting the struggles people experience, which I appreciated. After graduating high school, Corey Out May 7th! Pre-order from Amazon here! What did I really like about this book? As I've already mentioned, it showed the struggles people experience in their everyday lives, highlighting vulnerabilities and insecurities. Written from both the perspectives of the rich and glamorous and the poor and working class, I enjoyed the juxtaposition of higher and lower class characters in terms of lifestyle, but seeing how similar their lives were in terms of challenges and personality flaws. 1. I felt like there was a lot of redundancy in terms of story line. To be honest, there wasn't a whole lot of substance but the author managed to stretch out the story across 300 pages. I did feel there were times where the story was continuously rehashed and I ended up losing patience and attention along the way, wishing it would get to the point a little faster. 2. In my opinion, the characters made some awful decisions that didn't seem super realistic. If they would have just made a different (and more logical) decision in the beginning of the book, everything would have been a lot easier on everybody. 3. I struggled with the "crime" plot holes. Spoiler alert: There would have been a mountain of forensic evidence pointing at all of the main characters, but somehow that wasn't the case in the end. I found that portion of a story a tad hard to believe. 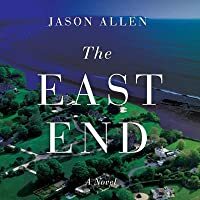 Overall, although there were some elements that I didn't care for, I enjoyed Jason Allen's writing and appreciated the premise of The East End. If you're looking for a book depicting realistic characters who attempt to overcome their flaws and struggles, this is the book for you. I'm very conflicted on how to rate The East End by Jason Allen. I was fascinated by the synopsis and anxious to read an ARC. Unfortunately it was almost like bait and switch, in my opinion. The book did not really live up to the excitement that the synopsis promises. I didn't feel that there was an explosive ending. I will say that I wanted to find out what was going to happen so I kept reading, but a good portion of the book was filler, going over mundane daily tasks and interactions that didn't I'm very conflicted on how to rate The East End by Jason Allen. I was fascinated by the synopsis and anxious to read an ARC. Unfortunately it was almost like bait and switch, in my opinion. The book did not really live up to the excitement that the synopsis promises. I didn't feel that there was an explosive ending. I will say that I wanted to find out what was going to happen so I kept reading, but a good portion of the book was filler, going over mundane daily tasks and interactions that didn't do anything to move the plot forward. I believe that this is the author's first book and I would definitely read other books by this author in future. I think he needed a little coaching and some better editing and this could have been a very good read. I think the bones are here and the character development also, it just needs to move quicker and wrap up loose ends that seem to be brought up and left to wither. I do realize that this seems to be a book that you either love or dislike, with not a lot of middle ground. Evidently I'm smack in the middle - one of the few. I would rate this 2.5 stars. Corey is a thief and he is quite good at it. Leos house is the house thats being broken into. The writing was very good and kept me wanting more. I instantly liked Corey and thought he was great (and a horrible human being but thats part of the reason why i liked him) and took me effortlessly into the wealthy world, behind those closed doors that Corey opens. 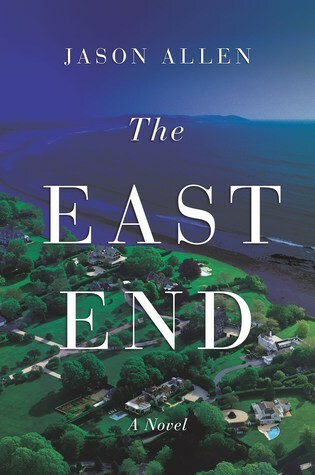 Thank you so much to Park Row via netgalley for sending me an ARC copy of East End- by Jason Allen. This will be released on May 7 2019. Thank you to Harlequin and NetGalley for an e-ARC of this book in exchange for an honest review. Corey, his mother, and brother are a middle class family that are tied to a rich family: his mother works for them. One night while spying on a girl he likes (friends with the daughter of the rich patriarch), he witnesses a death. Craziness ensues and all hell breaks loose. Secrets abound, Corey and his family try to figure out what to do. This book was just ok to me.